During the first weekend of November Kitty Young Auxiliary puts on a Holiday Crafter's Marketplace. It has recently been held in our building at 5107 Evergreen Way. Over 50 juried artists and crafters sell hand crafted items. Raffles of donated items from vendors, and snacks and sweets are available for purchase at this event. This is a good way to start your holiday shopping. Join us for a three-day art and craft pop-up sale featuring artists and artisans from across the Puget Sound region who work in a variety of media! Stop by the Museum to browse their work, meet the artists, and find the perfect piece to add to your collection of local art! Fri Oct 5th: 4 - 8pm Art Walk is happening at this time! 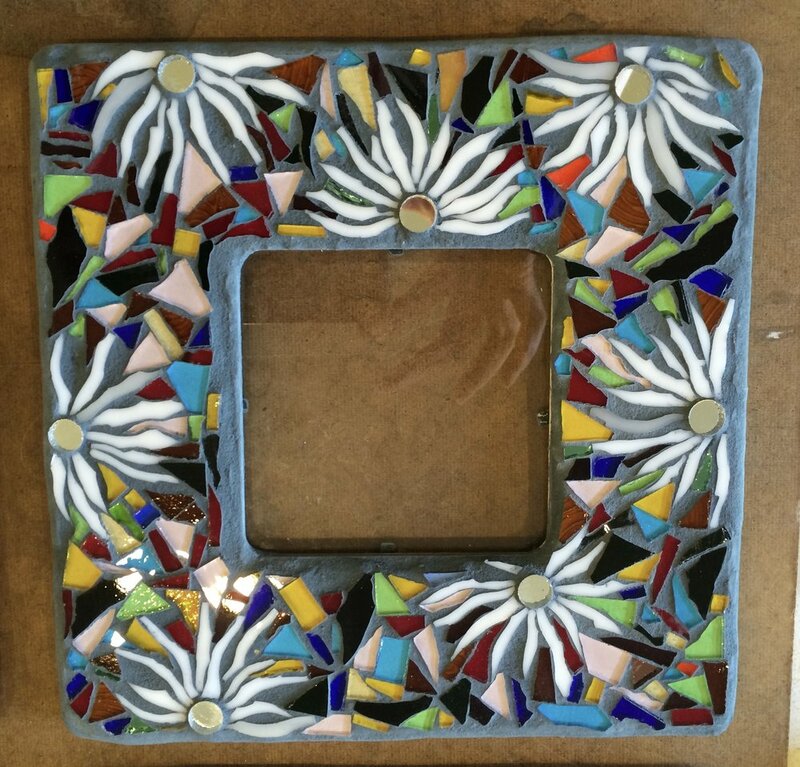 Come learn the double indirect method of stained glass mosaic making, and create a beautiful and unique porcelain display tray! 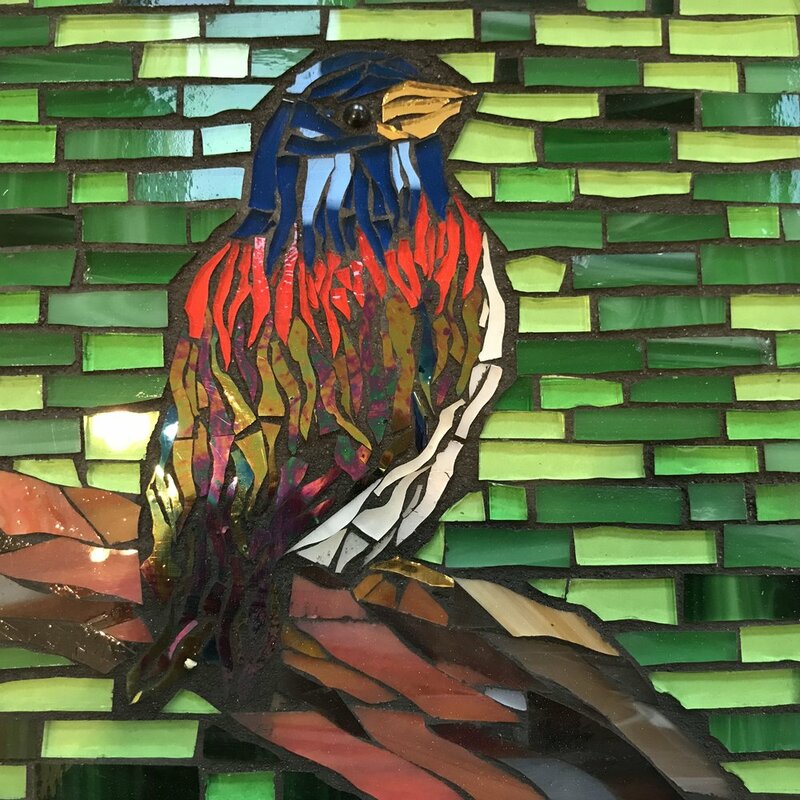 During this 4 hour workshop, you will learn how to create a mosaic using the double indirect method, and also learn to cut stained glass with wheeled nippers. I will then take your creation for cementing and grouting, and the finished piece will be ready for you to pick up in 1-2 weeks. No experience necessary, all materials are included. Come see new art by myself and more than 30 other amazing artists at the monthly Kirkland Art Walk! Beauty, art, fun, wine - what else could you ask for? Come and explore mosaic making! During this workshop, you will learn how to create a mosaic using the double indirect method, and also learn to cut stained glass with wheeled nippers. You will then put your new skills into practice creating a beautiful tray. I will then take your creation for cementing and grouting, and the finished piece will be ready for you to pick up in 1-2 weeks. No experience necessary, all materials are included. Tickets: $15 for all ages; $20 on Day of Tour TICKETS ARE LIMITED-Buy Early! Meander through the showcased gardens in Cypress, Evergreen, Fairway, Juniper, River Crossing and Scarborough (just east of Mill Creek) This year’s beautiful gardens run the gamut from a woodsy yard of just under an acre, to a stunning deck garden and everything in between. Come to the Kirkland Art Walk and see my new work at Parklane Gallery! Good fun and plenty of good art! Come and explore mosaic making at Blue Raven! 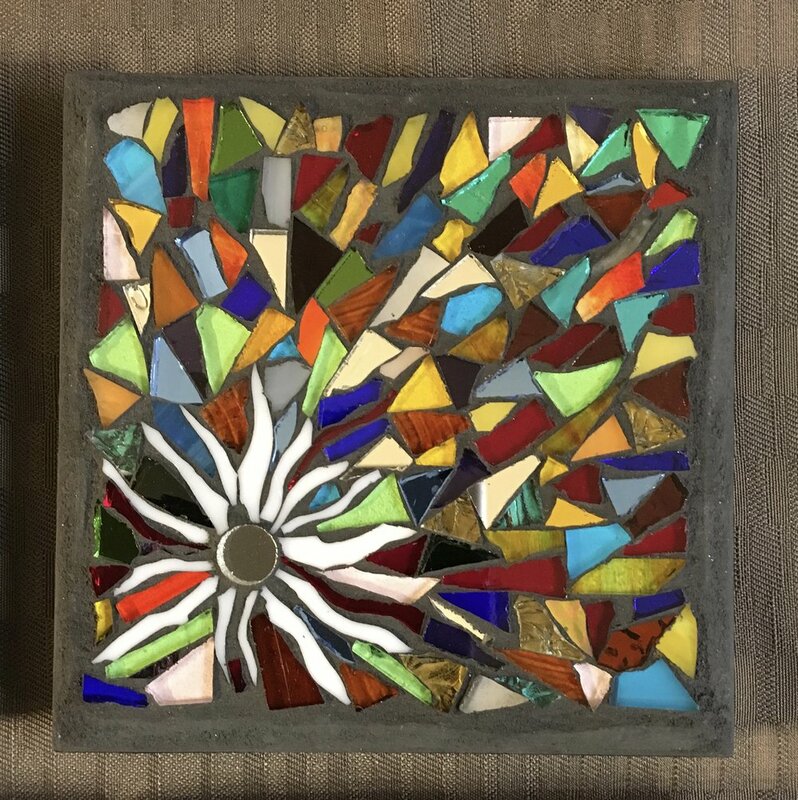 During this open workshop, new students will learn how do make a mosaic using the double indirect method, which you will then put into practice creating a beautiful 6-inch wall hanging or trivet. Cost $55. I will then cement and grout your creation for you to pick up in 1-2 weeks. Come out and see the amazing exhibition of art at this years Best of KAC! I'm thrilled to be included! Bring your imagination to this fun class where you will learn the double indirect method and create a frame or mirror mosaic, your choice! During class you will design and lay out your unique creation, then I will cement and grout it for you to pick up. No experience necessary, all materials included. PLEASE NOTE: This is a different date than listed in the catalog. Date & Time: Saturday, February 24, 2018 Doors open at 5 p.m. Reception & Silent Auctions 5:00 to 7:00 p.m. Sip a Schack-tini while bidding on local art, wine, and more during silent auctions. Dinner & Live Auction7:30 to 9:30 p.m. Enjoy dinner and wine surrounded by beautiful works of art, and take home your favorite piece in the live auction. In this class, we will learn the double indirect method of laying mosaics to create a one-of-a-kind 11 x 11 personal art piece. You will make a unique 11 x 11 garden stone. After you create the piece; I will take it home for cementing and grouting and you will pick up the beautiful finished piece. Register at Schack.org. This will be the last workshop at Garden Essentia. Come and create a beautiful 10 x 5 tray, 6-inch wall hanging or trivet - you choose. During class we will learn the double indirect method of creating mosaics, how to cut glass and you will lay out your piece, then I will cement and grout it for you to pick up. All materials provided. No experience necessary. Call 206-453-3920 to register. New workshop! Bring your imagination and create a beautiful frames house number or name piece - you choose. During class we will learn the double indirect method of creating mosaics, how to cut glass and you will lay out your piece,, then I will cement and grout it for you to pick up. Please include what you want on your sign when you register. All materials provided. No experience necessary. Call 206-453-3920 to register.